There has never been a better time for sport to hold a major conference on ethics. After all, the issue of integrity - whether related to vote-rigging, match-fixing or cheating - has never been more relevant. Money continues to pour into professional competition, accompanied by a win-at-all-costs mentality, and there is a sense that this has left many sports increasingly vulnerable to exploitation. And so the inaugural 'World Summit on Ethics In Sport' could have been seen as the ideal opportunity to tackle such concerns. 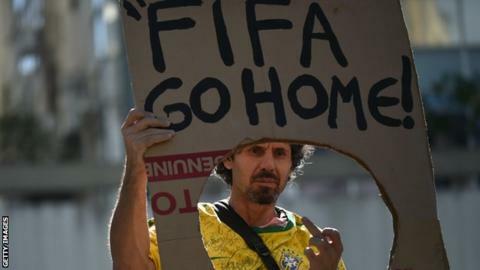 What, for many people, was hard to understand was why such an event was being held at the headquarters of Fifa, world football's governing body and an organisation that has become synonymous with scandal and allegations of corruption. As if to remind us all of the delicious irony, on the eve of Friday's summit, it was revealed that senior Fifa officials - along with national association chiefs such as Football Association chairman Greg Dyke - had accepted gifts of £16,000 luxury watches in goodie-bags given to them by the Brazilian FA during the World Cup, a clear breach of Fifa's code of ethics. There was more. We also learned that the world governing body's secretary general, Jerome Valcke, had intended for each Fifa executive committee member to be given a further two watches, this time from a sponsor, but had to be told by his own ethics committee that this would also constitute a breach of the rules. Shouldn't he have known? Whether officials were merely ignorant of the standards they have to adhere to, or just chose to ignore them, is unclear. Either way, it was the last thing Fifa needed. Dyke, meanwhile, has said he would hand back his watch. It was against this backdrop, at Fifa's lavish base in the hills above Zurich, that the summit took place. In his opening address, president Sepp Blatter made no reference to the embarrassment of 'watchgate', and afterwards I was prevented from asking him directly whether he had handed back his watch. His team of press officers shielded him from journalists as he quickly left the auditorium. But for anyone at Fifa headquarters on Friday, it was not hard to see why, even now, those who run football regard such gifts as nothing unusual. Fifa exists in a world where limousines fill the car park, and the average salary among its 412 employees is $220,000 (£122,500). As Michel Platini, president of European football's governing body Uefa, himself happily admitted on Friday, "we receive many watches". Now, this may well be true, but it does nothing to suggest that the culture of largesse is being tackled. Even though Fifa has introduced a range of reforms designed to improve its governance, many will argue that its old habits die hard. Why, the critics will ask, amid such damaging allegations of corruption, does Fifa not intend to publish the findings of investigator Michael Garcia's probe into the 2018 and 2022 World Cup bids? In a significant and telling speech at the summit, the US attorney himself said he felt "greater transparency" over evidence of wrongdoing was needed if Fifa's rules were to have the desired effect and provide a proper deterrent. Why, the critics will also ask, is Blatter standing for a fifth term as president, despite pledging in 2011 that his fourth would definitely be his last? And why did Fifa reject term limits for senior executives, as proposed by its very own Independent Governance Committee - set up to advise it on reforms? Campaign group Transparency International, which was also at Friday's event, said: "If Blatter is elected president again, it will be harder still for Fifa to be seen as an organisation committed to reform because the scandals that have so tarnished its reputation happened under his watch. "But should he publish the investigation into the World Cup bids and reconsider the need for independent oversight of its board and key appointments, that would - at least - be a start." The Associated Press has learned that Fifa did in fact hand out watches at the World Cup. The organisation spent around £90,000 on 750 Longines watches for delegates at its congress in June, although Fifa says it was allowed to do so because their value was "trivial". Fifa can host as many ethics summits as it likes. It can tell us that World Cup hosts will now be voted on by 209 national associations rather than its cosy executive committee; that its probe into World Cup bids is thorough and independent, and that those luxury watches will be handed back. But many will feel it still has a long way to go to regain the trust it has lost in recent years.